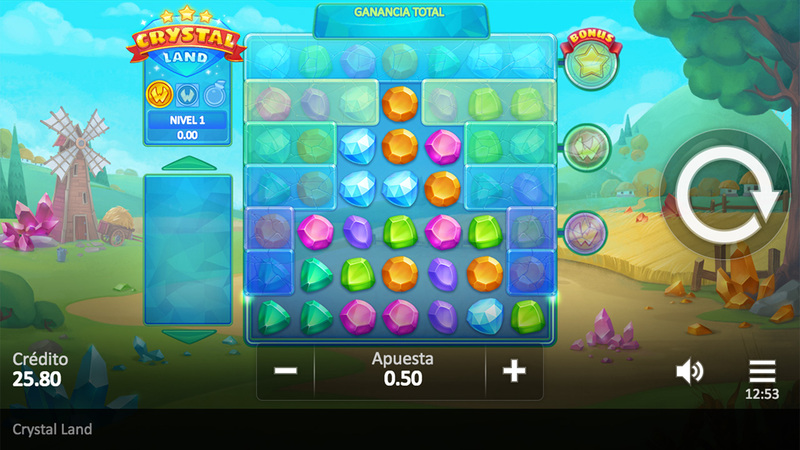 Overview: 7 x 7 grid, Pay outs for 5 or more of the same symbols, Crystal Features, Level and Level´s Bonus. 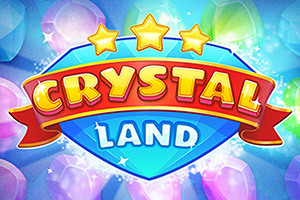 In this 7x7 video slot, you get the chance to visit 3 locations. Each spot gives the possibility to unlock the rows to get to the Bonus Round. As the game progresses, you will have a lot of fun boosters that will help. Boosters such as Random level feature, Bomb symbols, Wild and Ruby Wild symbols. There are no pay lines in the game. The game field is a 7x7 grid. Winnings are paid for 5 or more of the same symbols, which are adjacent vertically and/or horizontally. Winning symbols disappear and symbols fall down to fill empty cells. Multiple combinations of the same symbol that are not adjacent to each other pay separately. The round finishes when there are no more winning combinations on the game field. Part of the game field is blocked. There are 3 locations in the game. They differ in art background and random location feature. Location changes when enough crystals have collected, which were part of a winning combination. Symbols destroyed by a bomb are not collected.